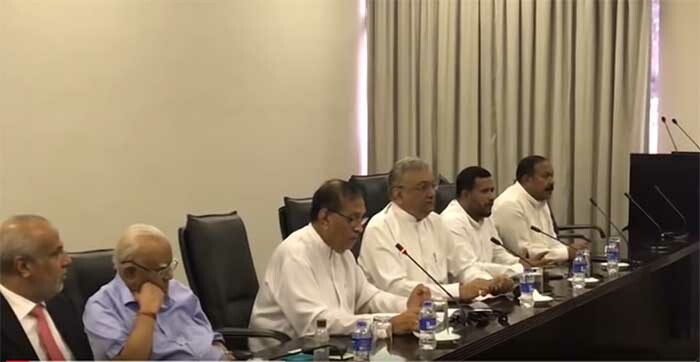 (Lanka e News – 03.Nov.2018, The party leaders and MPs who met at the parliamentary complex yesterday at the invitation of the speaker defeated the anti- state traitorous conspiracy of MARA –SIRA as not official , thereby confirming the MARA –SIRA junta cannot come even close to their much sought 113 members. 125 members in writing handed over letters to the speaker stating that the appointment of Mahinda Rajapakse as Prime minister by the president is unconstitutional and illegal . 121 members personally arrived in parliament to express their opposition openly and directly to safeguard Democracy , and oppose the appointment of the synthetic prime minister . Party Leaders of TNA , JVP and UNF were among the 121 members who participated . The speaker who contacted the MPS informed them the president has requested to re convene parliament on the 7th. However the speaker had told them whether the president re convenes or not , he is empowered to re convene parliament on the 7 th. The speaker had also invited all the party leaders to attend an unofficial meeting this afternoon at 2.30 to prepare an agenda paper along with the support of the party leaders to stabilize the country . ‘It is our government still. We have 123 with us . We are telling the officers who are abiding by illegal orders will be chased out by us’ warned Mangala Samaraweera.